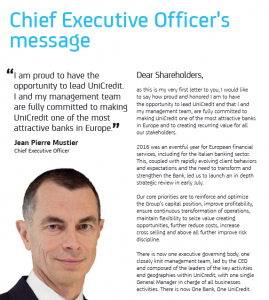 Unicredit – out of the frying pan? Let’s not forget that a 1-for-3 rights issue or even a 1-for-4 would be regard as “heavy”, i.e. highly dilutive, whereas an issue that is over 2 1/2-for-1 is almost unprecedented. It was made less than fully clear to the investors taking up the rights that Unicredit had already taken provisions against its loans and other difficulties – €12.2 billion – before the issue prospectus had been printed and in almost the same amount as the issue proceeds. The issue was billed as a “recapitalisation” but the impression given was that the issue would increase capital from its level as at 30/9/16, and not just replace capital lost between 1/10/16 and 31/12/16. Still more concerning is the disclosure made when the 2016 annual was finally issued, that the charges taken in Q4 2016 were the higer figure of €14.3 billion, swallowing up the rights issue, the entire 2016 profit, and the bank’s entire reserves. Reserves actually stood as -€2.5 billion on 31/12/16. In addition to this Unicredit persists with the Internal Risk-Based Approach to credit risk analysis that has led it to have over 20% of its loans in Italy go onto Non-performing status, and it uses its capital twice: to support its business in Italy and to support the businesses of its substantial foreign banking presences. If that were not enough, the critical FINO project has not been completed: the project to clear out the worst of Unicredit’s Non-performing loans in Italy. It appears that the market’s valuation of the FINO portfolio was lower than the heavily-discounted value at which Unicredit was holding it after the €3.5 billion write-down it took on the portfolio in Q4 2016. The ECB has launched an investigation into whether cash payments were made to induce the securitisation vehicle company to buy the FINO portfolio at a value higher than the market valuation, which then spared Unicredit from taking a further loan-loss write-down. If this is the case there would be extremely serious repercussions, whatever the difference in valuation. If the difference turns out to be material – like 2% of nominal value or more – then the protections afforded to the bank by its caveat on page 130 of the rights issue prospectus that the FINO portfolio might decline further in value before the transaction was fully completed – could be tested. A Material Adverse Change regarding a project that the bank itself characterised as pivotal for its own future would normally require a statement to the stock market, which has not occurred. The rights issue and the Strategic Plan were meant to get Unicredit out of the attention of regulators – out of the frying pan – but it appears that the bank is a long way from making a full recovery and its handling of the FINO project may well put it into the fire.